One of the busiest days of the year at Magic Kingdom is Christmas Day. And so my Christmas Day began like most days of the year, arguing with my Guides. It looked like it was going to be another day of me resisting my guidance. We live in Florida, we have annual passes to Disney World. We can go there when it isn’t so busy, any day. So going to Disney on Christmas seemed like a very bad idea, even to my daughters. I looked online at the websites devoted to telling you the best days to go, and the worst days. It was the worst day to go. The crowds would be at a peak. We have seen the parades, seen the light shows, and we do our best to only go when we won’t be getting elbowed, pushed and annoyed by stressed out tourists and crying over-stimulated children. Looking online I saw they would be open until 1 a.m. I am a late night person so we decided to go. We arrived after 8 p.m. We wandered around, took in The Haunted Mansion and The Bear Country Jamboree. Followed by Splash Mountain. By the time I was laughing and splashing on the wet roller coaster log ride, I looked around and saw the massive crowds had thinned and the park had an incredibly mellow energy about it. At midnight we were just hitting our stride, taking in more rides than we ever had before. It was easy. There were absolutely no lines for anything. We took in some rides we had never been on. We set personal records for the most rides in one evening. At one in the morning the employees were all still smiling and no one seemed anxious to make us leave. A little before 2 in the morning we were standing in front of Cinderella’s castle with a couple dozen other late night mellow families enjoying the peace and quiet of having the Magic Kingdom all to ourselves. I stood taking in the beauty around us. Not just the beauty of the castle lit up for the holidays, and not just the beauty of the late night or the stars overhead and the holiday music playing around us, but an even greater beauty that radiated from everyone present. The beauty that truly stirred me there at Magic Kingdom was love. Families were taking photos for other families. Couples were hugging and kissing. Strangers were wishing each other ‘Merry Christmas.’ And everyone there, standing with plenty of elbow room between us, were actually moving in to be closer to one another, to feel the love, to smile and give a warm greeting to one another. Like the closing scene in the movie “Love Actually,” I watched with teary eyes all the love and good will among everyone. Everyone was lingering in the magic. Employees of Disney seemed just as reluctant to end this fairy tale moment in time. 2 a.m. at the Magic Kingdom. The magic was alive and well. 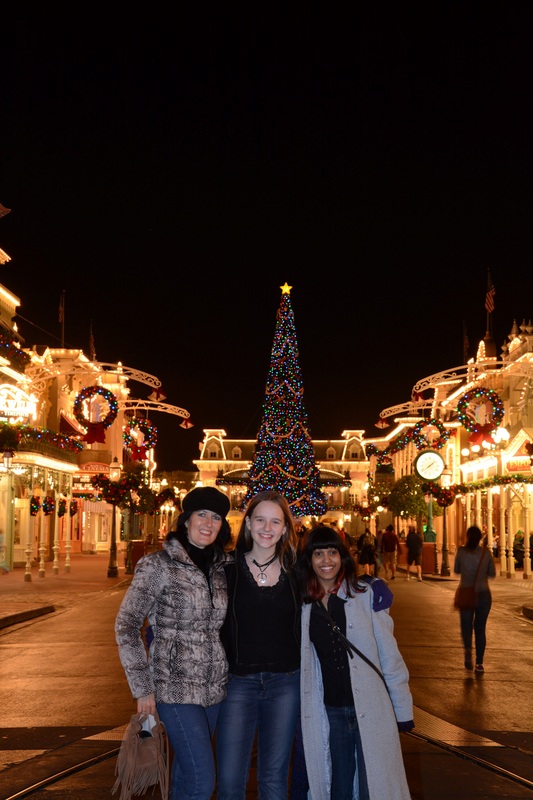 And I was glad I listened to my Guides and went to Disney for Christmas. No crying babies. Children were asleep in their strollers and moms and dads were kissing and holding hands. Teenagers were posing for photos, exchanging cameras to get pictures for one another. It was as good as it gets. Happy, joyful, loving people everywhere we turned. And this is the love I look for every day. I love love. I look for love, I send love, and I relish the love I witness. Love is all around us everywhere we go. Sometimes we are rushing too much to notice it. Sometimes we are too stressed to stop and look around. Next time you are anywhere, with other people, look for the love. It truly is all around everywhere we go. The magic lives in us all. Take it with you. Share it. Send love out and watch it return. Live a fairy tale life every day of the year.